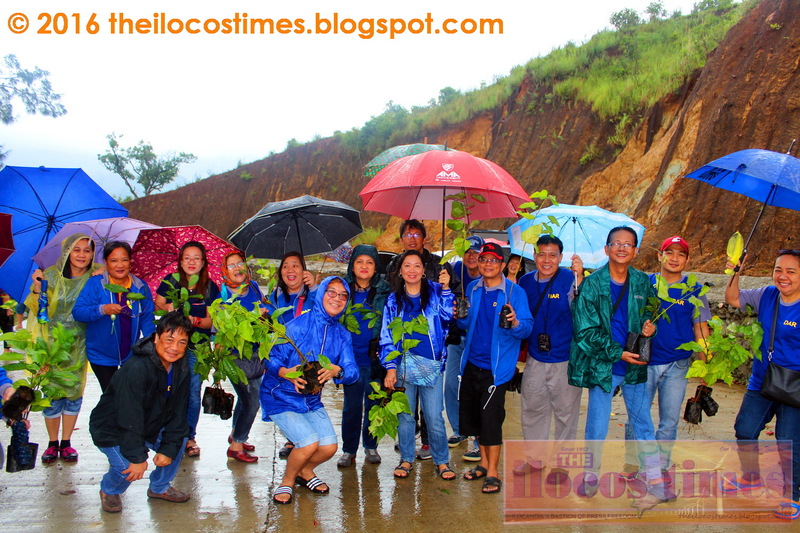 In support of the National Greening Program (NGP), the Department of Agrarian Reform Employees Association (DAREA) recently held a tree planting activity along the Ilocos Norte-Abra Road in Nueva Era, Ilocos Norte. The NGP aims to plant around 1.5 billion trees in lands of public domain such as forest lands, ancestral domains, mangrove areas, urban parks and open spaces, inactive and abandoned mine sites, river banks and streams and all other suitable public lands. Besides lessening the impact of climate change, the said program is also designed to promote food security, environmental stability and biodiversity conservation. According to Rommel Aquino, DAREA president, they were able to plant more than 200 cacao seedlings with the help of the local government unit of Nueva Era and the Department of Agriculture. “We will closely monitor the survival rate of the seedlings so that we can fully realize the objectives of the National Greening Program,” said Mr. Aquino. Meanwhile, DAREA also disclosed that they will sponsor a fun run this coming December. The fun run, which will be conducted in cooperation with the Bad Circle Runners, will serve as a fund raising activity for the outreach projects that the group is planning to hold in the different parts of Ilocos Norte. DAREA will soon announce the categories, routes, rules and regulations and other important details regarding the said running event. BARD NOTES: Happy bard-reading to Ilocos Norte Governor Imee R. Marcos, Laoag City Mayor Chevylle V. Farinas, Laoag City Vice Mayor Michael V. Farinas, Ilocos Norte Provincial Treasurer Josephine P. Calajate, INWD General Manager John Teodoro, Dr. Miramar Bumanglag, DAR-Ilocos Norte OIC PARO Vic M. Ines, DAR-Ilocos Norte CAO Rudy Acacio and PNB Laoag Branch Manager Metty V. Guerrero. Greetings also to the employees of AMA Laoag, DAR Ilocos Norte, DepEd Laoag, Vertext Handyphones, PNB Laoag and to the residents of Barangay 6, San Agustin, Laoag City.